AdEdge Water Technologies recently shipped an arsenic treatment system to the Arica – Pago de Gomez Water Treatment Plant in Chile, to reduce arsenic levels of 18 ppb in the water source, to below the arsenic MCL set by the World Health Organization of 10 ppb. The AdEdge system design features three skid mounted treatment units capable of treating up to 1760 gpm (587 gpm per skid). 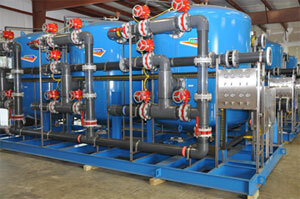 The AdEdge system will remove the arsenic from the groundwater supply using a proven oxidation/filtration process. A central component of the system is the AdEdge ADGS-Plus media which is NSF 61 certified for drinking water. Commissioning and startup of the system is scheduled for early June, 2012. AdEdge Water Technologies, LLC specializes in the design, development, manufacturing and supply of innovative water treatment systems that remove contaminants from process or aqueous streams. AdEdge offers a full range of conventional and innovative treatment technologies including adsorption, metals precipitation, coagulation, filtration, clarification, ion exchange, advanced oxidation, and membrane based solutions.